Detroit Lions and Chicago Bears: Monday night, no one was ready for some football. Lions and zebras and Bears—oh, crap. Is it possible that Hank Williams Jr. was more valuable to the NFL than everyone had thought? Till this week, I had always assumed that “Are you ready for some football?” was a rhetorical question. But during the Williams-free Monday night game between the Bears and the Lions, the answer seemed genuinely in doubt. 1-10-CHI 12 (7:05) 22-M.Forte right tackle to CHI 13 for 1 yard. 2-9-CHI 13 (6:28) 6-J.Cutler pass short right to 81-S.Hurd to CHI 21 for 8 yards. Timeout #1 by CHI at 05:40. 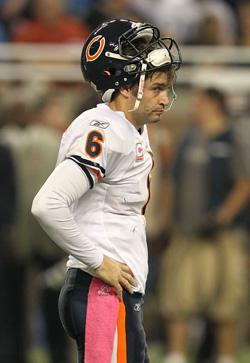 3-1-CHI 21 (5:40) 6-J.Cutler sacked at CHI 17 for -4 yards (92-C.Avril). PENALTY on DET-92-C.Avril, Face Mask (15 Yards), 15 yards, enforced at CHI 17. 1-10-CHI 32 (5:22) 22-M.Forte up the middle to CHI 34 for 2 yards. 2-8-CHI 34 (4:44) PENALTY on CHI-87-K.Davis, False Start, 5 yards, enforced at CHI 34 - No Play. 2-13-CHI 29 (4:17) 6-J.Cutler pass incomplete short right to 18-D.Sanzenbacher. PENALTY on DET-23-C.Houston, Defensive Pass Interference, 10 yards, enforced at CHI 29 - No Play. Detroit challenged the tipped pass ruling, and the play was REVERSED. 6-J.Cutler pass incomplete short right to 18-D.Sanzenbacher. 3-13-CHI 29 (4:13) 6-J.Cutler pass incomplete short right to 22-M.Forte. PENALTY on DET-79-W.Young, Illegal Use of Hands, 5 yards, enforced at CHI 29 - No Play. 1-10-CHI 34 (4:12) PENALTY on DET-90-N.Suh, Neutral Zone Infraction, 5 yards, enforced at CHI 34 - No Play. 1-5-CHI 39 (4:12) 6-J.Cutler pass incomplete short right to 22-M.Forte. PENALTY on DET-79-W.Young, Roughing the Passer, 15 yards, enforced at CHI 39 - No Play. 1-10-DET 46 (4:08) 22-M.Forte left tackle to DET 42 for 4 yards. 2-6-DET 42 (3:33) 22-M.Forte up the middle to DET 35 for 7 yards. 1-10-DET 35 (2:55) 6-J.Cutler scrambles up the middle to DET 31 for 4 yards. 2-6-DET 31 (2:13) 22-M.Forte left tackle to DET 30 for 1 yard. 3-5-DET 30 (1:31) PENALTY on DET-92-C.Avril, Neutral Zone Infraction, 4 yards, enforced at DET 30 - No Play. 3-1-DET 26 (1:10) 22-M.Forte left tackle to DET 26 for no gain. Timeout #2 by CHI at 00:15. So, really, literally: Was anyone ready for some football? This was a matchup between a defending division champion and an undefeated up-and-comer. At least one of Monday’s contestants ought to be a playoff team this year. Especially since a whole batch of this year’s expected contenders—the Eagles, the Falcons, the Cowboys—have failed to rise to the opportunity. Somebody has to be good, right? But it’s hard to believe you’re watching the NFL’s elite when the teams can’t even line up for a snap. The Associated Press, eager to dispense some sunshine, wrote after the game that the Lions’ “67,861 fans created enough noise to rattle the Bears into nine false starts.” If so, the fans need to be more judicious, because they rattled their own team into four neutral-zone infractions. In the end, Detroit and Chicago combined for 15 assorted penalties for premature action. Early in the second quarter, though, with the Lions on offense, my glazed eyes noticed a pair of long blue socks lining up at the top of the screen. Hey, there’s Calvin Johnson­—and then Matthew Stafford heaved it down the field, and the towering receiver shed his initial defender, gathered in the ball, and stiff-armed the safety with disdain, like a mailman shutting the gate on a yappy Pomeranian. Seventy-three yards. For a brief moment, football seemed glorious. Those moments were widely dispersed, though. There was a really fabulous gritty catch by the Bears’ Devin Hester—one series after the speed specialist let a possible touchdown slip through his fingers—which set Chicago up for a touchdown and a 10-7 halftime lead. And there was the third-quarter handoff to the Lions’ Jahvid Best, who darted through a nice big hole at his own 12-yard line, made a single cutback, and found the whole field open. The 88-yard run was the second-longest rushing touchdown in Detroit’s history, the TV broadcast said. I assumed the longest had belonged to the astonishing Barry Sanders, the only person who’d made Detroit Lions football interesting or relevant in my lifetime up till now. When I checked—the game did provide plenty of downtime for looking things up on the Internet—it turned out that Sanders’ longest career run was only 85 yards. Nor was it a touchdown. The actual record-holder is Bob Hoernschemeyer, who broke off a 96-yard scoring run against the New York Yanks (né New York Bulldogs) on Thanksgiving Day in 1950. Where was I? Oh, the Lions-Bears game. Right. The Lions are good, probably? Their offense was like an 11-man tribute to Sanders: no gain, no gain, no gain, long touchdown, no gain, no gain. And Detroit certainly did have the best player on the field, regardless of which team had the ball: Johnson when they were on offense, and Ndamukong Suh on defense. Detroit’s rampaging defensive line could have been the story of the game, if they hadn’t kept undoing their own efforts with roughing or facemasking or illegal use of the hands. And it was remarkable, in its way. The play-by-play, with cruel indifference to degree of difficulty, merely says “pass short left … pass short left … pass incomplete short left … pass short right.” But Cutler—last seen being criticized for his failure to stick out a playoff game on a wrecked knee—was constantly on the run, throwing off the wrong foot, delivering the ball to the nearest Bear he could find. Not many quarterbacks would have been able to match that desperate precision under the circumstances. By game’s end, the Bears had become detached from the traditional narrative logic of game calling, let alone the deeper percentage calculations. The clock was dying and the percentages were dying even faster. The only thing for the Bears to do was to strike for a touchdown—to have already struck for a touchdown—for them to have any imaginable chance of winning the game. But Cutler had crossed over into the same waking-nightmare state that Donovan McNabb was in during Super Bowl XXXIX, as the Eagles offense dawdled away any hopes of a comeback. Cutler’s intentions no longer had anything to do with winning, or even scoring—his world had shrunk down to the space between finding the next dumpoff receiver and getting clobbered by the Lions again. Checkdown, crawl to his feet, checkdown once more. That was the only thing he could do, so he did it.